How Many Licks, um Books, Does It Take to Get to the Top of the Best-Seller List? Great topic, Kristen! TNT! Love it! I only feel overwelmed when I don’t plan and make list. Things get forgotten and then stress and anxiety sinks in. That’s when I pull out my monthly goals and reprioritize my task list for the week to see how I can get back on track. When I do, my life is more peaceful. Your post made me remember that I want to take my small list made yesterday with me today, so after a lunch date, I can swing by the market (gotta have the cat and dog food, even if nothing for the children), and then pop into library to pick up two items on hold and drop off DVDs so I don’t get charged. Especially because one of the movie, All About Steve, was just about the worst movie in the history of movies. I don’t want to pay my library for the wasted time I spent watching that godawful movie. How could Sandra Bullock and hunky guy, what’s his name (I’ll have to look it up . . . OK, got it) Bradley Cooper make a terrible movie? And why did they agree to be in it? Anyway, about the taxes? Me, too. Frog hopping all over my desk and in my head since January. Filed for extension in April so I could prolong the freakin’ agony. Finally started tackling the taxes last week. I totally LOVE this post. You write so many home truths here but for me the biggest is that uneaten frogs cause depression, anxiety and procrastination. I have a big project on right now and when, at lunchtime today, I realized I couldn’t eat because of the knot in my stomach or apply myself fruitfully to any singe task that it was time to make that phone call I’d been putting off until tomorrow! Am off to make some lists. I love that you pointed out the “small to large” technique. We learned in college that any tiny little accomplishment is enough to keep you making more. It boosts your self-esteem, prepares you to take on the bigger stuff. Everyone is always asking me how I have so much time to do things. It’s because I plan, because my routine is formed and in shape. My daughter is even so stuck on routine she will tell me when it’s 9am to eat, or when it’s 10am to sleep (usually in the form of crying haha). My house is clean because I have a set “daily do list” stuck on my fridge. I don’t see one giant mess, I see “Today is the day I dust.” or “Today is sweep the floors day.” It’s the same way with my writing. I have a specific time each day I get to write. I tackle the small stuff (blog, maybe a query) and then I get to work on the next project. It’s all in how you sort your time. I also have an awesome husband who helps with everything. That’s it, I’m going to get off work today and go home to scheme, er, I mean plan, and start getting things DONE. The time I spend writing is my way of avoiding TNT….especially for housework. There’s an old riddle that applies, methinks. There are five frogs sitting on a log. Four decide to jump off. How many are left? Kristen – Love the TNT! Just stuck it to my computer as a daily reminder. I have been eating frogs for several years, but didn’t know that was what I was doing. No wonder the taste never improved. I was so motivated while reading your terrific post that I stopped midway through to complete some pressing tasks. Sheesh. Thanks for the wind in my sails today. This hit me hard, Kristen. I deal with depression anyway, usually well controlled with meds (and past therapy). I am a list maker, but a list that’s too long can be overwhelming. Big things, and even little things with deadlines, hang over my head, settle on my shoulders, and weigh me down until the read depression kicks in. My college creative writing classes give me some smaller tasks and some HUGE frogs. Create a literary short stories on command? Three weeks to do a rough draft, and I kept putting it off and putting it off. The sheer amount of all the combined work weighs on me, especially a month into the semester, and here was this frog to eat on top of it. I would put it first, but just stare at it in trepidation – which meant not only did the frog not get eaten, but the smaller stuff piled up too. I finally managed to get an outline version down, and then work on one section a day – BEFORE I do the other stuff. I guess I do best when I combine the frog with the elephant (how do you eat an elephant? one bite at a time). Hmm, I see a blog post in this, if the schoolwork ever lets up. Anyway, thanks for the frog image – I’ll be keeping that in front of me for a long time. And thanks to Edward above, too – I’m off to check out Google tasks. Cheers! We do need accomplishment to avoid discouragement. I’m a great list maker and planner but this has been a bad week. I’ve run into a wall in my WIP. I’ve been writing ideas and settings and possibilities but nothing on the manuscript. I feel like a failure; my word count goals have gone unmet 3 of 5 days this week. Thanks for reminding me I need to sign up for WANA Con. Every one of the classes has given me new inspiration for my WIP and I’m expecting ten times that from the conference. This has hit me hard too, Kristen. Lately, I’m all over the place. I need to make lists! That’s the answer. Focus on what has to get done, and do it. Thanks for the virtual kick in the pants! Lists are a very good thing. Your brain has a function scientists call the completion factor. Your brain doesn’t like things that are half-done so it sees that list and nudges you to get those things done. Just don’t fall into the trap of putting a giant frog on there. “Write my novel” is not a list item. It is a dream and a goal. “Outline chapter 3,” “research heart surgery,” “write 2,000 words today” – those are the kind of items you should have on your list. Break the frog down into smaller parts. Since the kids have gone back to school I am serious about to do lists and I even put brush the dog on it. I am nervous now because I have to post something and get groceries. Friday 13th doh coming up LOL. I had a system, but it started overwhelming me because it wasn’t equipped to manage multiple projects. But I’ve always found that if I have one master list, and spend an hour each week going over it, if something new comes up, I immediately know which items are low priority and can be postponed. We are doing the same at work as well, to manage work flow. Thank you so much for this post. I needed to read it! I used to make a master list and then build smaller, weekly lists from that, but I started thinking that I could do just as well without it. But I’ve been feeling overwhelmed while simultaneously not getting anything important done. I just go through the day and do what needs to be done in the moment. Not a great way to live. Just reading this post has helped inspire me. I had not heard of Today Not Tomorrow before. It’s a new mantra that I will put in use. Oh my! I never go to the store without a list, otherwise, I’ll do the same thing! Love the concept of TNT and frogs (though I happen to think frogs are cute and wouldn’t want to eat them 😉 ). Thanks for the kick in the pants. I’ve been blasting through a few frogs today. No, actually a friend taught me that. She was really good with money. I have generally always been responsible but at that point I was REALLY overwhelmed. I love Dave Ramsey. Cash for EVERYTHING. It’s how we got our mattress, frame, delivery, warranty, and mattress cover for $1000. Cask is KING. emptied my emergency account for that one. But I CAN thank Dave Ramsey for my portfolio. When the market crashed a few years ago, I sank every extra penny I had into the market. I’ve have almost 75% growth on that little egg. Only wish I would have invested more. You hit the nail on the head when I realized the days (weeks) I don’t fill in the pages of my planner, I jump start depression. Hmm . . . why didn’t I recognize that? Thank you! I’ll always remember that. TNT – Today, not tomorrow. Good words. Wish I would have thought of them. The Art of Getting It Done is VERY good. Highly recommend. Thank you for the motivation, Kristen! It definitely helped on this unproductive Friday. Great thoughts, as usual! Planning makes a huge difference in the happiness of my family, when we plan we know what’s for dinner, where we are going, and when. I’ve found that seeking perfection is also a problem, if we can’t get things just right we are loathe to even start to try. It’s paralyzing. Here’s to productivity! FABULOUS! Thank you for this. Great advice Kristen. It reminds me a little of: “Give credit for partial acts.” Give yourself credit for partial acts so you can stay the path. Thank you for reminding me of this. Wonderful as always. Cracking stuff. I’m writing the third book of a trilogy. It’s really hard and it’s TNT all the way! I’m multitasking every single day since I make my living as a medical translator (requires lots of research and knowledge and lots of hours at computer), teach art classes, paint, draw and sketch as much as I can, participate in shows and art festivals, do sewing and design of my own clothes, obviously clean and take care of house, never eat out because of health conditions, etc. I couldn’t plan much anyway since I am working globally which means I do not know in the morning what jobs could run in and how big they are ( e. g. 4 pages or 100 pages). I don’t know deadlines, too. I have all lists in my head, as a translator I need an outstanding memory, and I can remember some tough term which came up 5 years ago, I mean, I remember the document where to find it, even though I am translating about 40K words a month. My memory is excellent only as visual memory. That’s why I would never forget what I have seen or seen in my imagination. Making lists and plans only in one’s head trains the brain and decision making capacity. List keeps you on a tight pass, logical thinking is more flexible. I’d never get everything done if I acted by the plan. I deal with worst and most complicated things first and get done at first anything which I don’t like. I can enjoy much more everything I like afterwards. People rely a lot on devices, like iphones, ipads, simply phones, reminders, notes, notifications, etc. This all can be replaced by developing the brain capacity which we are never using at full anyway. Most people use only tiny bit of what their brain could really do. Visualization, visual imagination and memorizing logical sequences can do wonders. Forgot to mention, I completely agree with you that TNT is mandatory for everybody who has to manage his/her own time. That’s definitely the best one can learn and apply every single moment. When I tackle the tasks on my lists I’m fast and efficient, but what I’m working on eliminating is the time I waste on social media. I don’t think social media is a waste, but the time I devote to it is out of proportion to the time I have available. I’m getting better. What can I say about Kristen Lamb. She was speaker at my Space Coast Authors of Romance chapter meeting and was fabulous. Funny, dynamic, charismatic, knowledgeable, extraordinary. 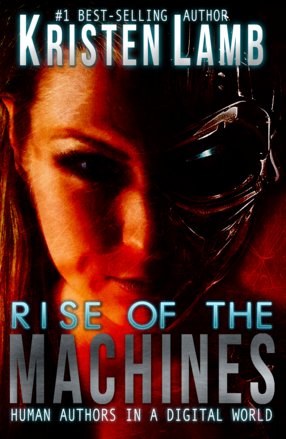 Hi Kristen, I loved this blog post as much as I loved your new book “Rise of the Machines.” Both are very motivating! I have a question regarding the blogging section in your book. In regards whether to choose between a free WordPress site for your author website–on which an author should be blogging–or the paid version for which you need a hosting service, you said the following: “Yet, if at all humanly possible, go ahead and get your author website. You’ll thank me later.” This confuses me. Did you mean “get the paid version, the .org version of WP”? I mean, whether you sign up for the .com version–the free version–or the paid version, you’re still getting your author website. I’m about to get one and want to do what’s best. I have even contacted your tech guy Jay already. Could you please clarify your statement? Thanks again for writing such an incredibly helpful book! Am telling everyone about it! Get the PAID WP site. Go to WANA’s homepage and we have deals on hosting and building you a web site for VERY reasonable. I am stuck with the free version unless I want to tank my following. So LEARN FROM ME. On this blog, I have to redirect from my web site. I can’t have a shopping cart, ads and there are A LOT of limitations. WP is VERY user-friendly, but just go ahead and get your own domain. Will save a headache later. That snwer your question? AND SO HAPPY YOU LOVED ROM! Um, kind of. The only thing that’s always been crystal clear is that you should get your own domain name, no matter if you choose .com or .org. I assume you mean the big mistake you made was not getting your own domain name? The price on web hosting on the WANA homepage is the same as on Jay’s homepage. Unless I’m looking at the wrong WANA page. So, since I can always upgrade from .com to .org as long as I’ve bought my domain name, I don’t see any advantage with getting a self-hosted site (which I assume you meant by PAID WP site). If my funds were unlimited, I’d just hire Jay to design everything for me. You can pay to get the domain name. That is the same. Web hosting? A different matter. What if a hacker infiltrates your page? Is everything backed up? Jay booted a nasty hacker who thought it funny to put a laughing SKULL on my page. NOT FUNNY. Jay booted the hacker and restored my content. As far as web design? We offer a VERY talented designer who is also a writer and knows we are not made of money. She does BRILLIANT work for a fraction of the cost. Jay and I work together so that might be why you are seeing the same prices for hosting. I don’t care if I make a DIME, I want writers to have a great start. Jay is impeccable, and I have been through THREE hosting sites. Okay, thanks for taking the time to answer my questions. Great post! I’ve shared it on my FB author page. The only way I get anything done is if it is on a list. I was in a car accident this week (No one’s fault–strictly mechanical. The hood opened while I was driving and smashed my windscreen–very scary) Since then I’ve been wandering around in a bit of a fog. Things have been getting done, but part of my brain is worried that I’m forgetting something. I went back to the list today. I feel so much more in control, and I can see that I actually do have time to chase down some frogs. Thanks for the reminder. I sometimes think there is a comfort to wallowing in that feeling of being overwhelmed…especially for us procrastinators. It is completely self-defeating, but it also means we don’t have to get up off the couch. I appreciate the small to large mentality and the encouragement to eat frogs. It encourages me to put my “big girl” pants on and get crackin’. You mentioned taxes, and this is something I’ve been wondering about myself. Perhaps you’d do a future blog post on taxes for writers? It seems to me that when you are building a brand, you are also laying the groundwork for a business, and suddenly I have all these questions. How far in advance of publishing should you get a business license? When you set up your brand? Or when you are about to publish? Inquiring minds want to know! All too true. Have some scary ugly frogs in my life! I love the way you motivate and the comparisons and metaphors you use. You made me smile today, Kristen (again) – not because it’s so funny – but because I’m happy to have the chance and read your blog posts. Thank you for sharing. This is good stuff ….keep it up!